Transitional cell carcinomas have a variety of CT urographic manifestations. They can appear as large masses that compress, distort, and obstruct the renal collecting system or ureteral lumen, thereby producing proximal renal collecting system or ureteral dilatation (Fig. 3). When these cancers are located in the intrarenal collecting system, the axial CT images can also be utilized to determine whether there has been renal parenchymal invasion (a feature of these tumors that affects their stage). 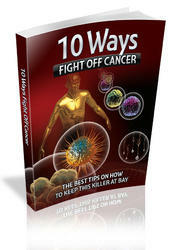 Some cancers are detected when they are still quite small (less than 5 mm in maximal diameter). Small cancers may produce tiny filling defects in the calices, infundibula, renal pelves, or ureters. These are best (and sometimes only) seen on MDCTU when the excretory-phase image review is performed using wide windowing. When only soft tissue windowing is utilized, such small tumors can be completely obscured by the very high attenuation of adjacent excreted contrast material (Fig. 4). Figure 1 Renal cell carcinoma. 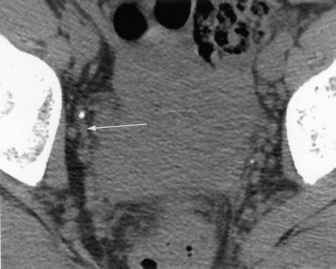 (A) Contrast-enhanced nephrographic axial CT image demonstrates a large heterogeneous solid mass in the lower pole of the right kidney (arrow). (B) The mass is also well seen on the coronal, excretory-phase, average-intensity projection 3-D image (arrow). Abbreviation: CT, computed tomography. pyelography, because these studies rely solely upon luminal abnormalities to identify urinary tract pathology. They do not image the ureteral wall. On CTU, one cannot rely solely on 3-D reconstructions or thick-section coronal reformatted images for detecting transitional cell carcinomas. Axial images must be evaluated. The majority of transitional cell carcinomas (particularly those that are small or produce no luminal abnormality) are not seen if only these post-processed contrast-enhanced images are reviewed. Figure 2 Ureteral calculus. 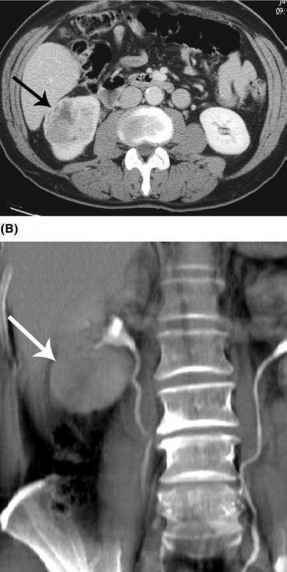 (A) Noncontrast axial image demonstrates a small calculus in the distal right ureter surrounded by a rim of soft tissue attenuation (soft tissue rim sign) (arrow). (B) The calculus is also identified on the coronal excretory-phase, maximum-intensity projection image as a small, higher attenuation focus within the contrast-enhanced ureter (arrow). Note that there is mild dilatation of the more proximal portions of the ureter and of the renal collecting system, despite the fact that excretion was not significantly delayed. Figure 3 Transitional cell carcinoma. (A) A mass in the upper pole of the right kidney surrounds and grossly thickens the wall of the contrast-containing right upper pole infundibu-lum on this excretory-phase axial image (arrow). (B) Although the mass itself is not seen, irregular narrowing of the infundibulum is suggested on the coronal excretory-phase, volume-rendered 3-D reconstruction (arrow). Source: From Ref. 22.